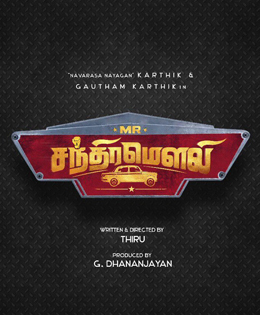 Thiru’s next has been titled Mr Chandramouli. The film has Karthik Muthuraman and Gautham Karthik in lead roles. The title and first look of the project was unveiled by Sivakarthikeyan on social media yesterday. To be directed by Thiru of Naan Sigappu Manithan fame, Regina Cassandra is Gautham’s pair in the film and Sathish will take care of the comic portions. The latest update from the team is that two National Award winning directors—Mahendran (Mullum Malarum) and Agathiyan (Kadhal Kottai) will be seen playing pivotal characters in the film. Mahendran has been roped in to play a successful businessman in Mr. Chandramouli while Agathiyan will play actor Karthik’s friend. Interestingly, Agathiyan is also Thiru's father-in-law. "I've gone on his sets when he was directing Hindi and Telugu films. But this is the first time ever that he will be coming on mine," says Thiru. He further stated that it would be interesting to see Karthik, Agathiyan and Mahendran in the film. Both Karthik and Agathiyan share good bond with each other as they have previously worked together in Gokulathil Seethai.